As you all know, when it comes to frozen yogurt, I’m OBSESSED! The creamy, delicious treat is one of those comfort foods that never go out of style, no matter the season. I’ve spent years scouring the marketplace for one that is low in sugar, high in protein and fiber, friendly for those lactose-sensitive folks, and still has the texture that real ice cream provides. Well, the search may have finally come to a sudden HALT, thanks to Halo Top Creamery! I couldn’t be more impressed with this maker of all-natural light ice cream. Some of the flavors available in your grocer’s freezer today include: Vanilla Bean, Chocolate, Strawberry, and Lemon Cake. Since I frequent Whole Foods Market for many health products, I was pleased to discover this is one of the leading retailers carrying the product! As compared to other similar products, Halo Top takes the cake in texture, taste, richness and protein content. It is one of the few frozen treats of its kind that actually tastes like real ice cream. The Vanilla Bean tops my list because of its creaminess and intense vanilla flavor, but I dare you to try each flavor and let me know which one you like best! Want to give it a try? 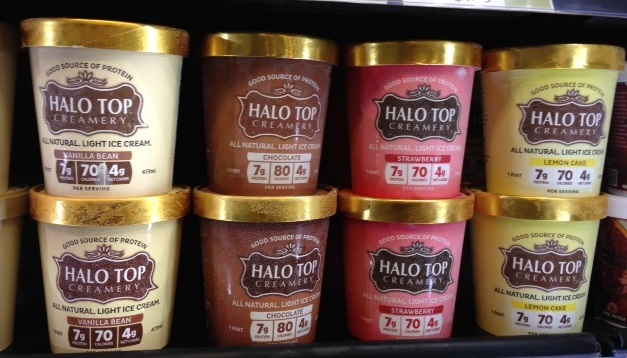 Find out where to buy Halo Top Creamery All-Natural Light Ice Cream HERE.